A mother has extinguished a 'petrol bomb' thrown at her home in the early hours of today. Detectives in Dungannon are appealing for witnesses following a report of a petrol bomb being thrown at a house in the Springdale area of the town around 3.30am. Detective Sergeant Fiona Mulholland said: “A resident in the house heard a loud bang around 3.30am and found that an item had been thrown at the downstairs living room window and was on fire outside the house. “A 46 year old woman extinguished the fire herself by throwing water over it. There was broken glass on the ground and some scorch damage to the exterior wall beside the window of the property. “She and her 24 year old son were asleep in bed at the time of the incident. Neither she nor her son were injured but they were left shocked." 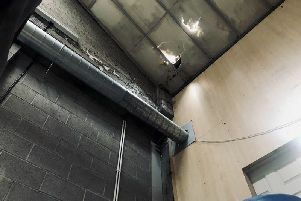 Two men have been arrested in connection with the incident on suspicion of arson with intent to endanger life. They are currently in custody. “We would like to hear from anyone who saw any suspicious activity in the area around 3 – 3.30am this morning. Please call police on the non-emergency number 101 quoting reference number 109 of 11/1/18," added Det Serg Mulholland.